I see you are building up a lot of steep hillsides that probably aren't all going to be rock faces. Are you going to install the backdrop first to use as a guide for developing the 3D scenery? Looking forward to seeing how you handle the hillside scenery, as I have quite a few "impossibly steep" hillsides to deal with myself. Yes, the rest of the backdrop prints are on the way. My hills are steep and there will be rock castings on the vertical surfaces. My hope is that I will apply the rock castings on the steep faces and the blending of the castings into the plaster base will give me lesser looking slopes that I can stick bushes and trees on creating the look of not too steep slopes. I also plan on using a lot of small bushes and trees around the rock castings to help blend it all. When I look at photos of rock faces around the area I am modeling I notice that there are lots of small plants growing out of them and I seldom see that feature modeled, I think that will help blend a lot of it together and set it apart from a Colorado looking layout. Unfortunately my space is tight and I will have to use some scenery tricks to my advantage. I really like the backdrops as well. This is some fantastic stuff you are putting up there. I actually liked your painted backdrop as well. I remember reading all about your struggles with it earlier in this post. But the new backdrop is just fantastic. Am actually now considering an upgrade to my backdrop. 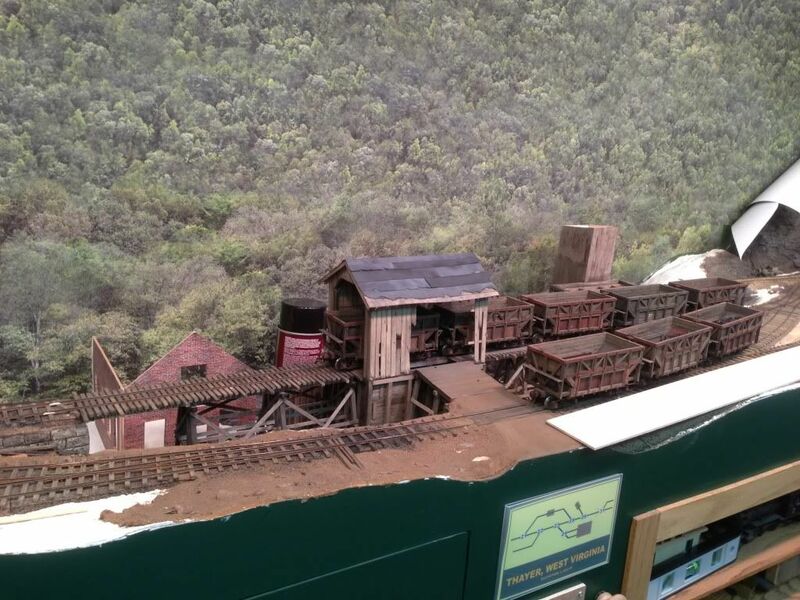 You are making fantastic progress scenery wise on you layout. The rock castings came out nice on that tunnel portal shot with your stunning loco in front of it. I personally am using the same technic with the rock castings. It works very good for me as well. I actually have no problems with those steep hillsides coming out of the backdrop. I needed to make the exact same compromise due to space constraints. The vertical castings will work out just fine. They did on my layout. I did excactly what you are thinking about, planting trees and smaller shrubs around the area. Given the accomplished and skilled modeler you are this will be a piece of cake for you and come out just fine. After an initial base of ground paint I recommend using real dirt as sub base before you start using foliage on and around those rock castings. It will blend in just fine and look great. 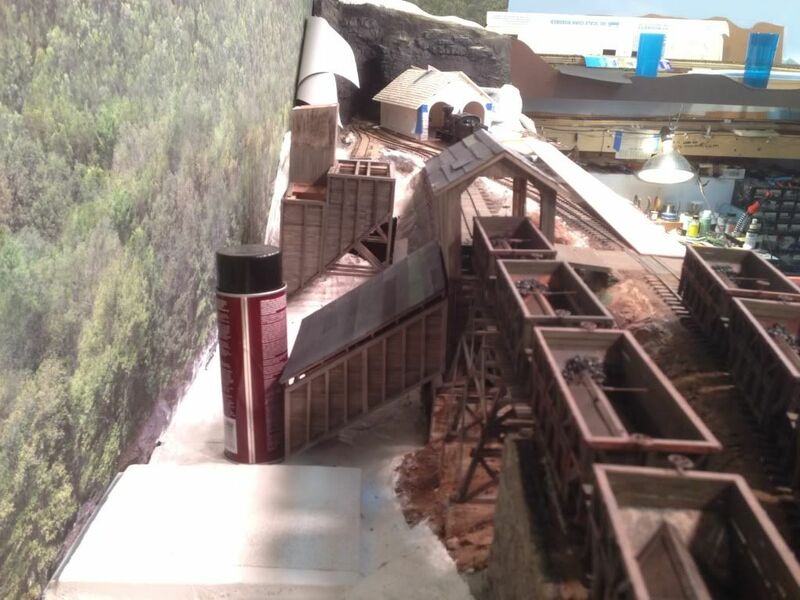 I like what you did to the front of the layout where the main track shoots out of the tunnel leading up to the mines opting for a lower hill side right at the edge / fascia of the layout (3rd picture from the bottom, page 38). Your initial idea of building high mountain scenery at the layout ledge (7/1/13 post, page 33) in order to shoot great looking photos might have compromised the overall layout look if you stand in the room since you would be mostly looking at fascia facing that wall. The way you have it setup right now, I think is a great compromise. The A-frame bridge already looks great. Thanks for the close up photo as I was just researching A-frame bridges myself. 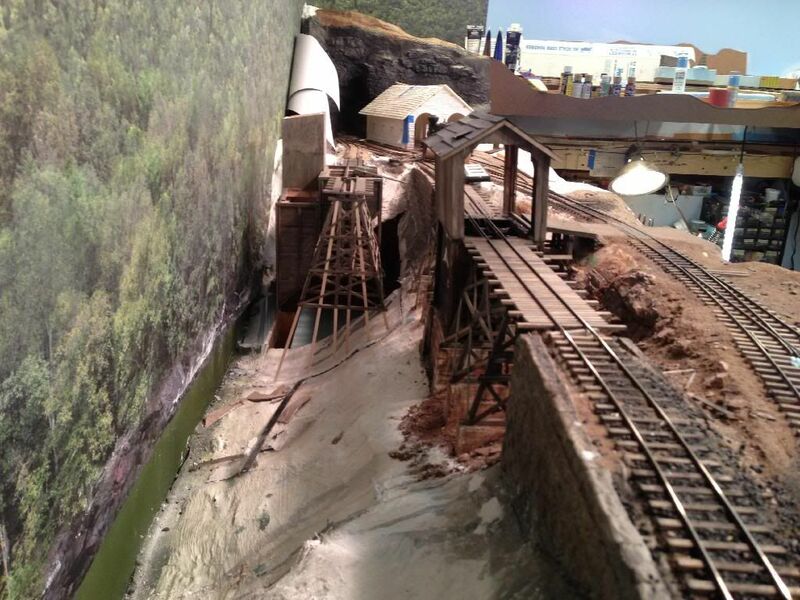 I just started putting one together (road bridge) leading over a river to a George Sellios coalyard scene (I model HO). Your shot helped me a lot finalizing my design. Can�t wait to see some paint on top of that white plaster. Keep the updates coming. Living in Milwaukee, WI myself (-8F this moring) it should be pretty cold over there in Minneapolis, MN as well, meaning its modeling weather and progress should be made. I enjoy the updates Jeff.. look forward to more. 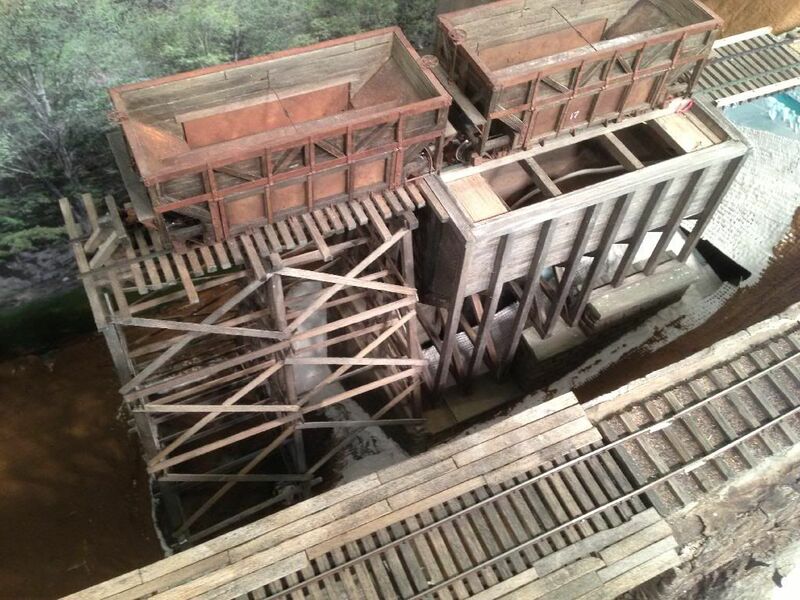 I am in the process of building the rest of the dump trestle structures, which include the chute and the conveyor to the coke dump bin, and the coke dump bin itself. The distance between the two dump bins are much closer than the Manns Creek were so my conveyor and coke bin are going to need to be modified to fit the space. I also added the MC's power house but I moved it to the other side of the chute because there was not enough room to put it next to the coke bin. The power house is a brick structure. I will post some photos when the structures look more like structures, they have a ways to go. I also swapped out the Soundtraxx decoder in my shay #8 for a new TCS WOWsound decoder, it is very nice and the prototype operation feature makes it very interesting to do switching with, going down my steep grades is pretty interesting as well. finally got a chance to get back to the layout room. I have been hard at work trying to get the coke coal dump bin built and installed. On the prototype Manns Creek the coke dump was located further away from the coal dump and located basically in line with it, my space is much smaller so I have to have a separate stub spur that will allow two hopper cars at a time be dumped, not very prototypical but that is one of the freedoms I get by building a freelanced railroad based off the MC. 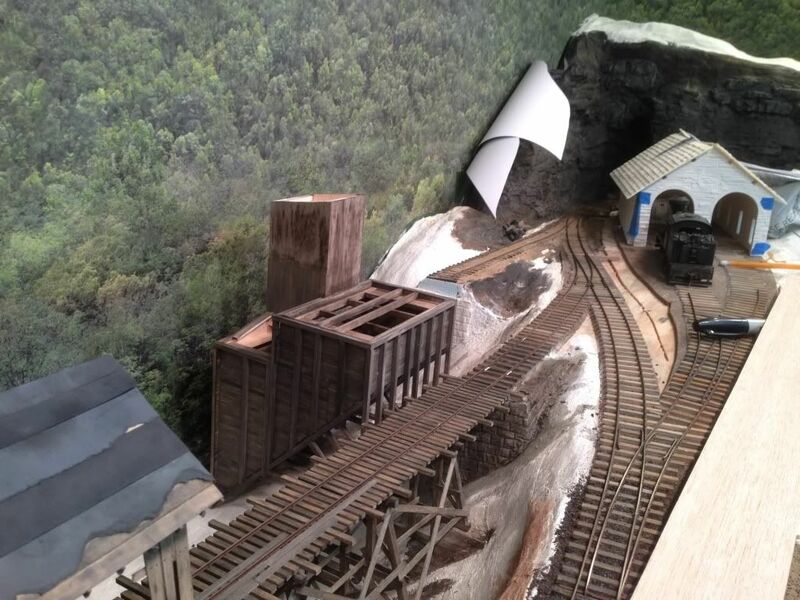 My arrangement will also provide more of an operating challenge and add some time for the crew working the dump area, which will better balance the times I have two operators working the railroad. here is what the bin will look like in place. there will be a short trestle located off the end of the bin to allow one empty hopper to be shoved past the end so another loaded car can be dumped. There will also be a covered shed over the bid like the first one (sans the hole in the side). I also built a section of the chute that leads from the first dump bin to the sizing plant. On the MC this chute was longer than I have room. Also, because of the limitation of the backdrop printing I had to raise up the bottom of my scenery a little, I will use some scenery tricks to make it look like it falls away more than it does. The prototype MC's sizing plant had a roof like that followed the chute roof, mine will be a gable end that will come out a few inches from the backdrop, the reason for this is that a gable roof that meets that backdrop as a flat looks better than the side of a roof, especially if the roof is falling away. I wanted to try to add the long conveyor that goes from the first dump trestle (coal sizing plant) to the coke bin but I am not sure there will be enough space between them to make this look good, I am still working on that design. Another structure I was thinking of adding to this area is the powerhouse that the MC had, theirs was located next to the coke bin which was a little farther down the hill and not as visible from the tracks. 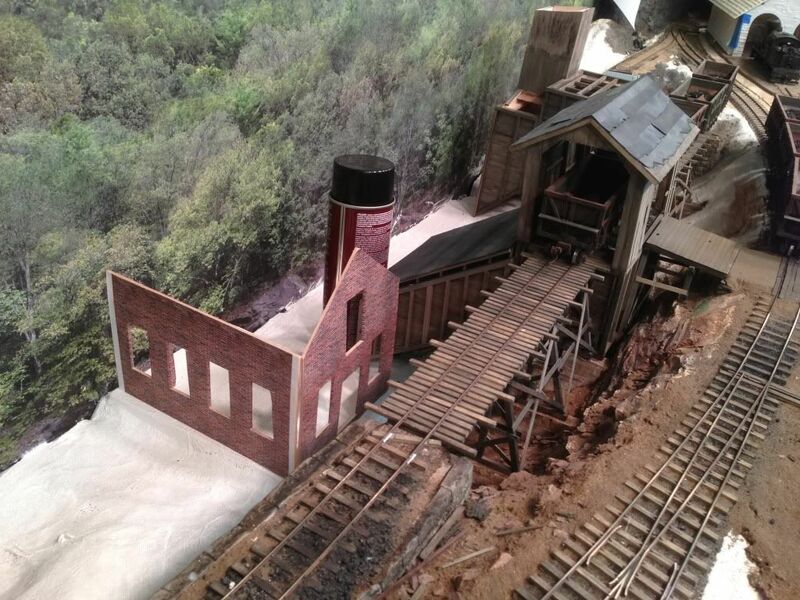 I like the look of the small brick structure but it would not fit on my layout where the MC had theirs. A location I was thinking of placing it was to the left of my coal sizing dump bin. I made a couple walls of the structure and covered them with printed brick. I built a foundation for the structure in the existing scenery but I am a little undecided on the structure. I like the added complexity to the coal plant area but I am a little afraid that the location will lose its remoteness. I would like to get some feedback on what you guys think. please excuse the tar paper on the dump shed roof, the method I used to glue it down did not work as expected and I have to glue it back down. The cute roof turned out much better. It is really coming along now that you are placing all the elements into the scene. That last pic for sure really does the intended of making they view as you described it earlier. Wow, awesome work. Just getting caught up on your posts. It is hard to tell from the photos just how much space you have in the "flats" down in the holler below the narrow gauge tracks. I am thinking you just have room for a larry track and possibly a view of a small section of the coke oven bank viewed from above and behind. The powerhouse might be best represented by a scaled down flat on the extreme left, mostly obscured by the hillside with the chimney being the prominant feature. The prep plant may also be mainly a flat. If you are planning to have any standard gauge track in the bottom with a few cars, maybe you should work out the position of that first, then work everything else around it. Mark, you may have just given me an idea, Let me give something a try and I will get back to you what it was. Once again, some very top notch modeling Jeff. I love the ground cover you have going here- it is unique and different. I agree with Mark that were you to introduce selective compression to some of your structures, it would make them all fit better. Will there be any trees down there? If so, they would help to conceal the compressions or false fronts where needed. 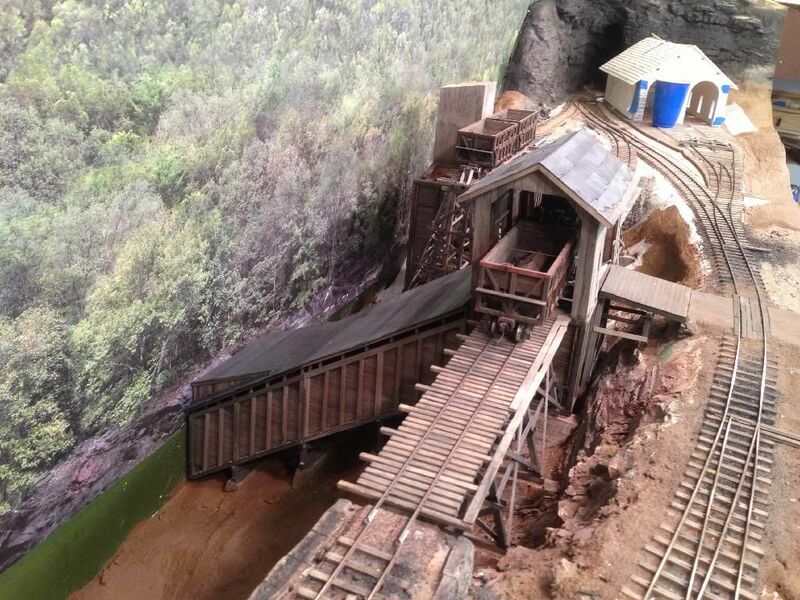 I tore out the raised bottom that I put in, I didn't like how it took away the look of being up on the side of the mountain look I was going for, I have never been to Thayer, maybe it does not look like that there but I think having the narrow gauge up on the side of the hill is what I wanted from day one. so I will have to figure out how to hide the bottom edge of the backdrop, a tree line will work but I am looking into another solution first before I do the easy tree idea. The trouble I have now is that I had already built the bents of the coke trestle to meet the raised gorge bottom, so I am in the process of extending them. I will have to lengthen the coal chute to meet the back drop where I will have a flat of the coal tipple. 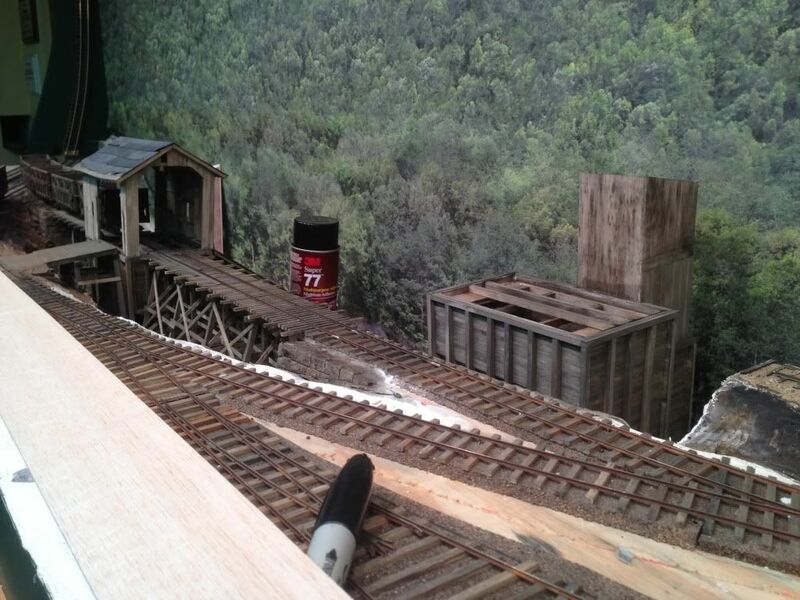 the pressure is on now because I sold an article to Model Railroad Planning 2015 issue and by March 21st I need to have both trestles basically finished and the ground cover in this area done, so I really have my work cut out for me, might even have to take some days off work to make some serious progress. here is a photo with the raised bottom removed. The bottom of the backdrop image was damaged so I have to touch it up a little. Just a note to anyone using Trackside Scenery backdrops, don't try to wash them, they are just like large laser prints and the ink is water soluble. I may try some experiments with the scraps of backdrop I have to see if I can spray them with something to seal them. You could print these out full scale, cut them out and move them up and down, back and forth on the backdrop to see how they look. If you are in a real jam, I think you can photograph from certain angles to eliminate the dead spots or at least photoshop them away. Are you able to get your hands on some ready-made trees from a LHS? Just temporarily?